Yo my Digga's, Public Enemy rolled into town again over the Christmas break. There were the headlining band at the Falls Festival, but luckily for me they also did a side-show at the Corner Hotel on December 29th. This is the fourth time I've seen PE, I saw them in 1992 at Festival Hall with Ice-T, then in 1998 at the Palace in St. Kilda, with The Avalanches when they were still a functioning live band. Then in 2007 at the Espy Hotel. I'm pretty sure that's it - I do know they were here in 1990 and 2002, but I definitely didn't see them at either of those gigs. Their show was typically chaotic - lots of stops and starts, lots of random chatting to the crowd. They also tour these days with a band of sorts, a guitarist, bass player and a drummer. None of whom, it has to be said, are much good. 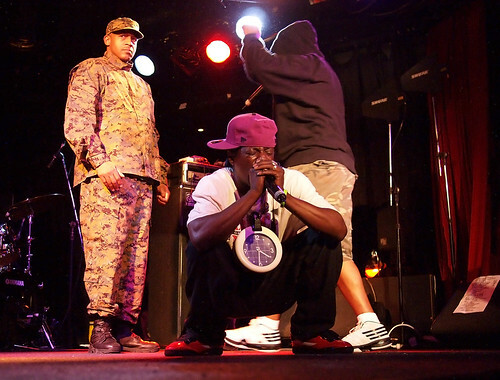 There are really only two members of the band - Chuck D and Flavor Flav, and most of the music seemed to come from backing tapes with the occasional scratching from their "new" DJ, DJ Lord. The way the mix was done I could barely hear the instruments (this might also have been because of the industrial earplugs I wear to gigs these days). At one point I counted ten people on stage - Chuck and Flavor, the bass player, guitarist and drummer, DJ Lord, two members of the S1W (Security of the First World, whose job mostly seems to be dancing), a random bearded guy who seemed to be part of their crew, and a random Korean MC who seemed to be part of their entourage. The stage at the Corner is big, but it's not that big! They also dragged a few other randoms onto the stage during the gig - one of the members of 2 Live Crew (I think it was Fresh Kid Ice), said chaps son, and another guy who I can't remember at all now. They also dragged four random Australian MC's from the audience and had them do their thing. Lots of their songs started well, then sort of petered out with random ramblings and redundant introductions of the band - I think the guitarist was introduced at least four times. OK, so, having done all that whinging, I did enjoy the show. It was based around their 1989/1990 album "Fear of a Black Planet", which was also the first album of theirs I got into. It has some dull tracks on it, but it also has "Fear of a Black Planet", "Welcome To the Terrordome", "911 Is A Joke" and "Fight the Power" on it. All of which they performed. Whatever else one can say about them, they have written some great songs, so it was great to hear them performed (again).